My skiing today was on slopes covered with what I would call pseudo powder. Several inches of new snow had fallen and as much as six or more inches of untracked snow was available. At first glance the fresh snow had the look of powdery material. However, the snow had sufficient density to lose the definition of real powder. In spite of the heavier nature of the snow It was a glorious day. Following many days of skiing hard pack and groomers the respite of deeper and soft snow was a pleasure. Perhaps I shouldn't be so critical of the conditions. Probably my attitude was influenced by the pictures my son sent me from Salt Lake City and the slopes of Alta and Snowbird. Powder there was so deep and light that face shots were the norm. See one of the pictures from son Colin below. I am looking forward to a Utah trip in February. I am hoping for real powder! 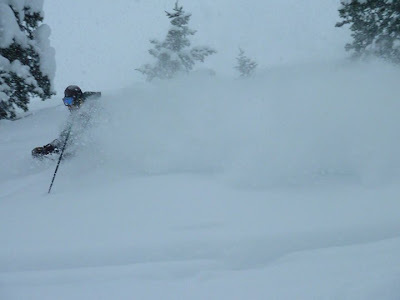 Go to Colin Rehkugler's Facebook site for more pictures of his recent romp in the powder.